This cover has everything: amazing vocals, gorgeous harmonies, and eye-popping holiday fashions. Everything about it is just so festive. From the outfits to the decorations, this cover of “Deck The Halls” sets a new standard for classic carol remakes. And please, girl, tell us: Where is that velvet dress from? We also like to wear burgundy, velvet gowns to crush vocal harmonies in a living room. Just another day for us too! There are a cappella groups, and then there’s Pentatonix. There’s basically no genre they won’t try, and no cover they can’t master. It’s rare to see professional a cappella groups as appreciated as Pentatonix is — and oh, are they ever. The group has a holiday album coming up, and is performing a Christmas-themed tour this year as well. They’ve won multiple Grammys, opened for Kelly Clarkson, competed on national television shows, and even cameoed in Pitch Perfect 2. 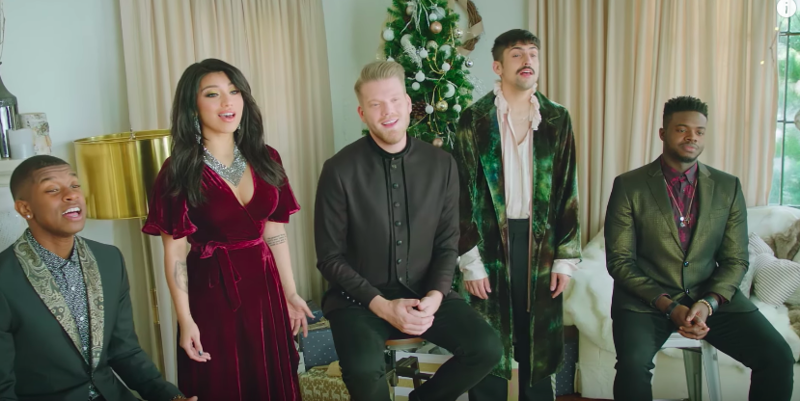 Not to mention, they have a Christmas special — A Very Pentatonix Christmas — airing TONIGHT on NBC. The perfect way to kick off the December holidays, if you ask us. So yeah, we’ll be listening to this a cappella “Deck the Halls” while we deck the halls this year. In our matching velvet gowns and platforms, of course!